The EyeArt® AI Eye Screening System is the most extensively validated AI technology for autonomous detection of diabetic retinopathy, tested on over half a million patient visits globally with over two million images collected in real-world clinical environments. The EyeArt system provides automated diabetic retinopathy screening without the need for expert human grading or eye dilation, enabling imaging, grading and reporting in a single office visit. The EyeArt system autonomously analyzes patient's retinal images acquired using an integrated fundus camera, robustly detects lesions and signs of disease, and returns an easy-to-read report in under 60 seconds. The EyeArt system incorporates a number of deep learning and image analysis algorithms to automatically assess the quality of the images, detect the presence and extent of lesions, and determine level of disease based on internationally recognized clinical scales. The EyeArt system is the world’s most-validated artificial intelligence (AI) screening tool for diabetic retinopathy, demonstrating high real-world sensitivity and specificity. It is proven to be safe, fast, and consistent. In a study with over 100,000 consecutive patient visits, EyeArt reports a 91.3% sensitivity and 91.1% specificity for referable DR and a 98.5% sensitivity for vision-threatening DR. The high-performance EyeArt AI algorithm automatically detects diabetic retinopathy quickly, accurately, and consistently, with higher sensitivity than an eye care expert trained in image grading. The EyeArt system is easy to use and with minimal training can be employed by nurses or technicians, enabling diabetic retinopathy screening at the point of care and eliminating an eye care specialist appointment just for screening. AI Eye Screening with EyeArt helps remove the biggest obstacle to annual DR screening and diagnosis: patient compliance. The EyeArt system makes it possible for any physician to identify patients with vision-threatening retinopathy in-clinic, in real-time, so they can be immediately referred to an eyecare specialist for treatment to save their sight. Whether you work with diabetes patients as a general practitioner, endocrinologist, diabetologist, ophthalmologist, or an optometrist, EyeArt can enable fast, reliable, and accurate diabetic retinopathy screening for your patients. Find out how easy it is to incorporate the EyeArt system into your practice. EyeArt can be seamlessly integrated with your clinical workflow to enable automated DR screening. Products under development. Click here to know more. I believe that an automated, reliable DR screening tool such as EyeArt would empower primary care providers to better manage their patients with diabetes. I believe that automation of common tasks like DR screening would have a tremendous impact on the quality and extent of vision care for the disparity populations. Therefore I am eager to work with EyeArt tool for DR screening. 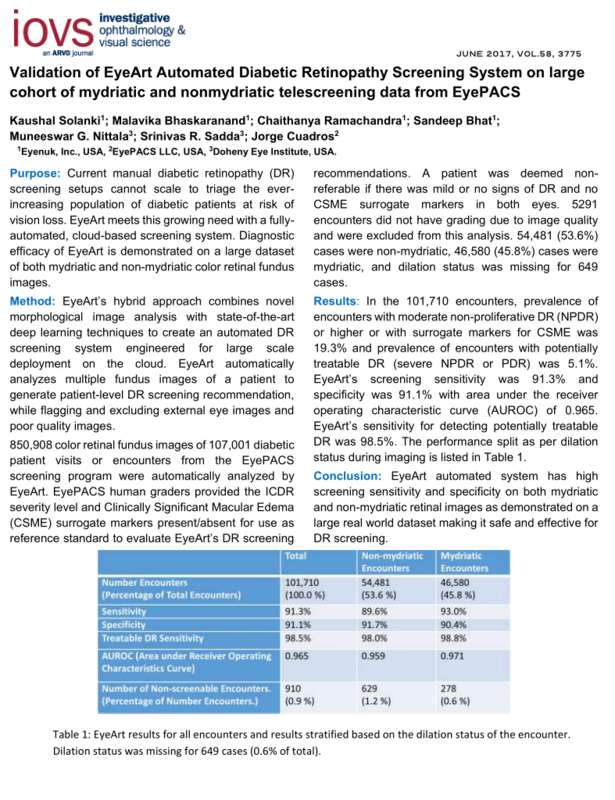 ...results of the large scale validation on over 100,000 patient encounters from the EyePACS database are highly encouraging and show that EyeArt can be a safe and effective alternative to manual screening. EyeArt’s automatic lesion detection and DR screening will allow us to better monitor our teleretinal patients at a lower cost in the under-resourced setting in which we care for Los Angeles’s most disadvantaged patients. The Doheny Eye Institute in Los Angeles, CA is recognized as a leading center for eye disease and vision research. The Los Angeles County Department of Health Services safety net serves more than 800K patients annually and runs a teleretinal DR screening program. Madras Diabetes Research Foundation (MDRF) in India was established in 1996. It's a premier research institute for diabetes and its complications. Washington University School of Medicine, St. Louis, MO is one of the leading medical research, teaching and patient care institutions in the US. The Armenian Eyecare Project (AECP) is a nonprofit organization dedicated to providing the Armenian people eye care to help eliminate preventable blindness. Diabetes Clinic Bad Mergentheim (Germany) is a specialist hospital for inpatient diabetes treatment. The National Health Service (NHS) is the public health service system of the United Kingdom. NHS runs the largest DR screening program in the world. CAMO, the Ambrosian Ophthalmic Center, is an eye clinic of excellence, in Milan, for diagnostics, correction of visual defects and treatment of eye diseases. 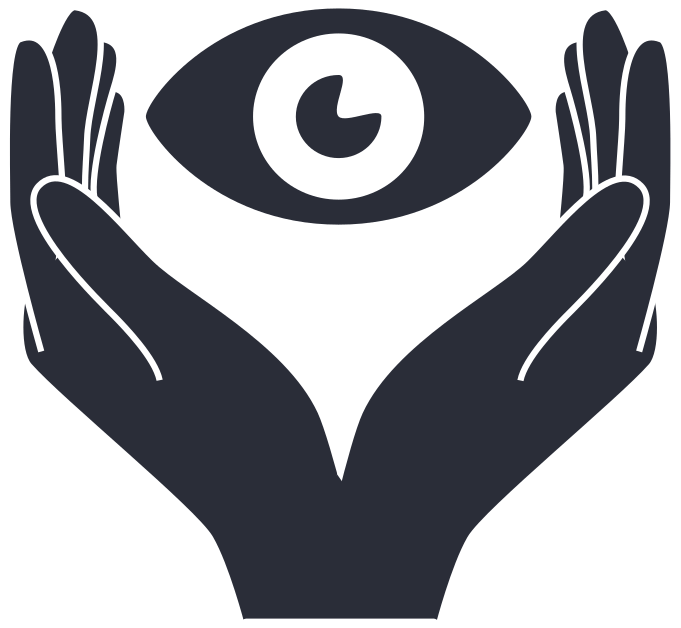 Eye Picture Archive Communication System is a non-proprietary web-based application for exchanging eye-related clinical information.